Pros: Used heavily for 3 years at overclocking voltages. Probably near the end of it's life but I still have it as a backup, it fired up a friends computer last time I tried. My computer just requires more power so I had to replace it. Cons: Perhaps only that it has to go to waist. for many people in just 4 years. Other Thoughts: Seems like repair would be pretty straight forward and these are plenty powerful to run most desktop computers. 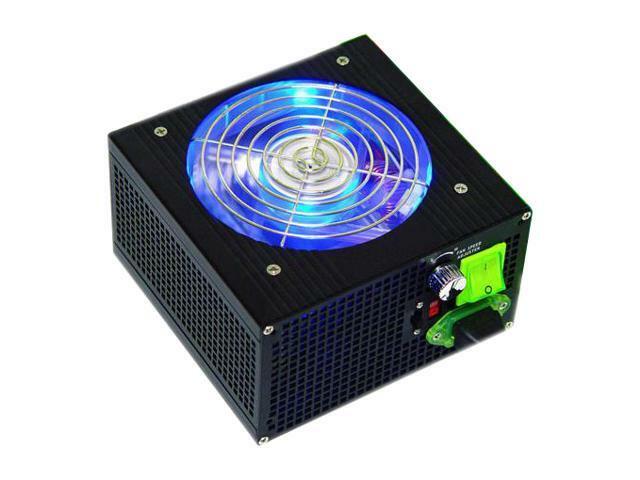 swap a fan and a case and you have a pretty generic looking PSU. Then use the fancy case for a refurbished model with higher Wattage. Pros: It was a great workhorse. Worth every penny. Lasted 3 years, doing more than it was made to during the last year. Other Thoughts: I bought this unit for my first build. It was more than enough at the time. I used it in my second build and broke a cardinal rule. The new system required a 700 watt PSU. My fault. The unit lasted a year flawlessly running this system. This is a tough PSU and I highly recommend this unit and plan on buying another Apevia PSU. Pros: Ran great provided solid power for ~4 years. Good enough to get it 4 eggs. Cons: Overheated and died my case had 6 80mm fans and this but it finally ate it.. Note: I ran this computer all day everyday more less. *Has been used almost 24/7 for the past 4 years, which isn't above its "life cycle"
Pros: I originally had this in a tower I built back in 2005. We are now nearing 2010 and it is still running strong in another machine. I blew the south bridge chipset on my asus mobo on the first build. It is now powering my roommates asus system. Cons: it wasn't powerful enough to put in my latest workstation build so i could save a few bucks... oh well. Other Thoughts: it still works. fantastic! Cons: died randomly on me. i was writing a paper for school and all the sudden my computer just shut off. because of it my paper was not finished in time and now i am stuck with a computer but now power suplies. Cons: The power supply just died on me a couple weeks after the one year newegg warranty. I'd strongly suggest the extended warranty with Service Net. Got my replacement check and ended up with a better price on my replacement.